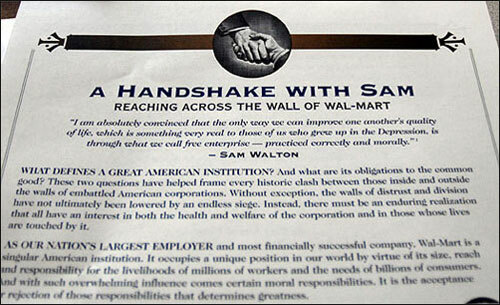 Are Wal-Mart backers courting New Yorkers by pretending to be Wal-Mart haters? Gothamist has the weird scoop on some characters in Grand Central Terminal today who were reportedly yelling anti-Wal-Mart sentiments while handing out pro-Wal-Mart literature—perhaps thinking no one would grab a flier if they revealed their true purpose right off the bat. The “protesters” were shouting things like, “Keep Wal-Mart out of New York City!” and “Keep Wal-Mart away from New York!,” according to the original report, whose author adds: “I’m not sure if I should be annoyed by this venture or totally impressed by the last guy’s ability to reel in an otherwise deaf audience.” If this is true, it’s slimy, bordering on devilish.